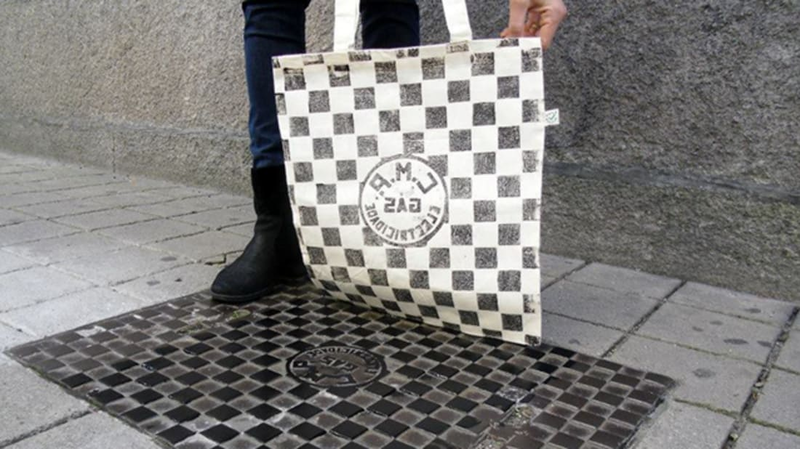 Berlin-based art collective Raubdruckerin (which translates to “pirate printer” in German) gives the term “street art” a whole new meaning: First, they apply ink onto manhole covers, vents, utility grates, and other public metal fixtures. Then, they directly imprint the pigment onto cloth or paper to create t-shirts, hoodies, bags, and posters with utterly unique graphic designs. According to Colossal, Raubdruckerin “prints” on-site in European cities like Berlin, Amsterdam, Lisbon, and Paris, and sells the resulting merchandise online. Prices begin at 15€ for tote bags (around $17 in U.S. money) and peak at 89€ ($100) for Raubdruckerin’s “Berlin Hoodie.” Check out some of Raubdruckerin’s wares below, or visit their website for more information.